Volkswagen's 2017 sales success continued into January as the automaker reported a 5.2 percent hike in sales. VW's is showing lots of success in increasing SUV sales as they now make up 53 percent of the automaker's volume. One interesting side note of the entire Dieselgate scandal was Volkswagen’s promise to American dealers that they would have access to an American-made three-row crossover – the hottest segment of an overheated market; that they would be able to name it, and that Herndon, Va., VW's U.S. headquarters, would direct marketing. Usually, Volkswagen uses a top-down approach. Wolfsburg decided on everything from the number of 4/40 screws to the name and marketing strategy for any vehicle. VW of America and its subsidiary dealers scored quite a coup when they received permission to name the new three-row crossover the Atlas, as well as driving the marketing effort. That the dealers won this ability was due, in no little part, to the Dieselgate scandal that was consuming VW at the time. The emissions scandal still is causing its share of upset in Germany, but in the U.S. it has been pretty much settled, though not before VW agreed to pay out more than $25 billion in settlements, penalties, and fines. Dieselgate was VW’s self-inflicted diesel emissions scandal. Indeed, the scandal had a significant impact on the automaker’s sales for 2015 and most of 2016. However, things began to turn around when the settlements occurred, and sales in the latter half of 2016 and sales trended into the black and kept on going. That they have kept on climbing has been borne out by sales records set by Porsche and Audi, two VW subsidiaries, as well as by the 5.2 percent sales increase in January versus 2017. In total, the automaker moved 24,744 units. That VW made a shrewd hunch when they decided to reorder their sales priorities to family-friendly crossovers, particularly those in the hottest segment of the market, the Atlas and the 2018 “Long” Tiguan. Sales of the Chattanooga-built Atlas totaled 4,303 units in January, while sales of the Tiguan were 6,336, the crossover’s best month so far. Indeed, crossover sales accounted for 52 percent of the vehicles delivered. The automaker used the recent North American International Auto Show to introduce the 2019 Jetta, slated to go on sale later this year. Jetta has been an essential contributor to Volkswagen sales efforts since its introduction. Volkswagen has seen sales of more than 3.2 million of the 17 million sold worldwide. 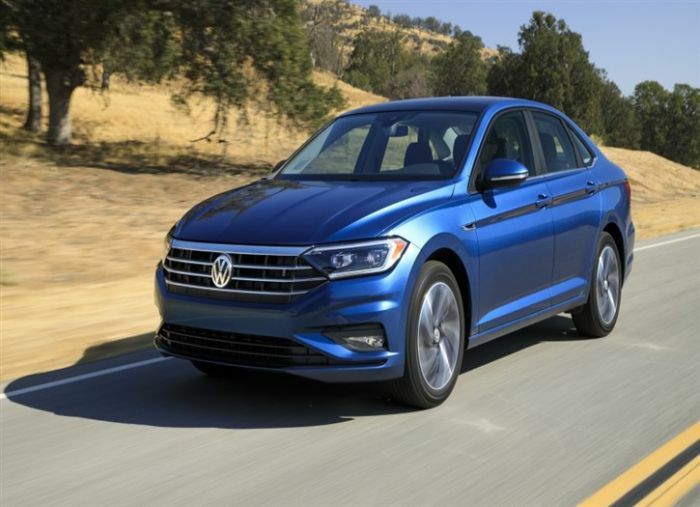 The 2019 Jetta’s design is bolder than earlier versions. It also offers more interior space and new technology. Though sales did slip in January, VW still moved more than 4,500 of them. One thing that should encourage VW sales is VW’s “People Fist Warranty.” It is a six-year or 72,000-mile (whichever occurs first) bumper-to-bumper limited new-vehicle warranty. In a departure from standard warranties, the VW warranty can be transferred to subsequent owners throughout its duration. Golf family (including SportWagen) , 3,541, 2018; 5.766, 2017; Jetta, 4,522, 2018; 6,846, 2017; Beetle, 1,112 (2018); 1,081 (2017); Passat, 2,434, 2018; 5,887, 2017; CC, 49; 167, 2017; Tiguan Limited, 2,034, 2018; 3,516, 2017; 2018 Tiguan, 6,336; Touareg, 404, 2018; 247, 2017; Atlas, 4,303; Total: 24,744, 2018; 23,510, 2017.